Republican nominee asserts that the women who accuse him of inappropriate behavior will face a court action, says Clinton invented the allegations. Francisco Kjolseth | The Salt Lake Tribune Temple Taggart, a former Miss Utah, is joined her lawyer, Gloria Allred, as they arrive at the Little America Hotel in Salt Lake City to talk about Donald Trump and his unwanted advances during a press conference on Friday, Oct. 28, 2016. Francisco Kjolseth | The Salt Lake Tribune Temple Taggart, a former Miss Utah, is joined her lawyer, Gloria Allred, to talk about Donald Trump and his unwanted advances during a press conference at the Little America Hotel in Salt Lake City on Friday, Oct. 28, 2016. Francisco Kjolseth | The Salt Lake Tribune Temple Taggart, a former Miss Utah, is joined her lawyer, Gloria Allred, to talk about Donald Trump and his unwanted advances during a press conference at the Little America Hotel in Salt Lake City on Friday, Oct. 28, 2016. Francisco Kjolseth | The Salt Lake Tribune Temple Taggart, a former Miss Utah, joins her lawyer, Gloria Allred, to talk about Donald Trump and his unwanted advances during a press conference at the Little America Hotel in Salt Lake City on Friday, Oct. 28, 2016. Francisco Kjolseth | The Salt Lake Tribune Temple Taggart, a former Miss Utah, who was joined by her lawyer, Gloria Allred, gets ready to talk about Donald Trump and his unwanted advances during a press conference at the Little America Hotel in Salt Lake City on Friday, Oct. 28, 2016. Francisco Kjolseth | The Salt Lake Tribune Temple Taggart, a former Miss Utah, is joined her lawyer, Gloria Allred, to talk about Donald Trump and his unwanted advances during a press conference at the Little America Hotel in Salt Lake City on Friday, Oct. 28, 2016. Francisco Kjolseth | The Salt Lake Tribune Temple Taggart, a former Miss Utah, is joined her lawyer, Gloria Allred, to talk about Donald Trump and his unwanted advances during a press conference at the Little America Hotel in Salt Lake City on Friday, Oct. 28, 2016. Francisco Kjolseth | The Salt Lake Tribune Temple Taggart, a former Miss Utah, is joined her lawyer, Gloria Allred, to talk about Donald Trump and his unwanted advances during a press conference at the Little America Hotel in Salt Lake City on Friday, Oct. 28, 2016. Francisco Kjolseth | The Salt Lake Tribune Temple Taggart, a former Miss Utah, joins her lawyer, Gloria Allred, to talk about Donald Trump and his unwanted advances during a press conference at the Little America Hotel in Salt Lake City on Friday, Oct. 28, 2016. Francisco Kjolseth | The Salt Lake Tribune Temple Taggart, a former Miss Utah, joins her lawyer, Gloria Allred, as they arrive at the Little America Hotel in Salt Lake City to talk about Donald Trump and his unwanted advances during a press conference on Friday, Oct. 28, 2016. Francisco Kjolseth | The Salt Lake Tribune Temple Taggart, a former Miss Utah, joins her lawyer, Gloria Allred, to talk about Donald Trump and his unwanted advances during a press conference at the Little America Hotel in Salt Lake City on Friday, Oct. 28, 2016. Francisco Kjolseth | The Salt Lake Tribune Temple Taggart, a former Miss Utah, is joined by her lawyer, Gloria Allred, following a press conference at the Little America Hotel in Salt Lake City on Friday, Oct. 28, 2016, where Taggart spoke about previous unwanted advances by presidential candidate Donald Trump. Francisco Kjolseth | The Salt Lake Tribune Temple Taggart, a former Miss Utah, is joined her lawyer, Gloria Allred, to talk about Donald Trump and his unwanted advances during a press conference at the Little America Hotel in Salt Lake City on Friday, Oct. 28, 2016. Republican presidential candidate Donald Trump arrives to speak to a campaign rally, Friday, Oct. 28, 2016, in Lisbon, Maine. 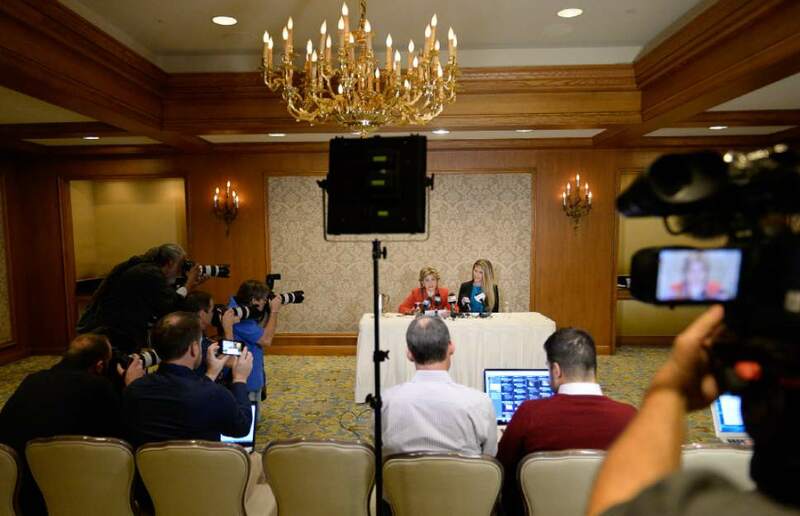 (AP Photo/ Evan Vucci) Francisco Kjolseth | The Salt Lake Tribune Temple Taggart, a former Miss Utah, is joined her lawyer, Gloria Allred, to talk about Donald Trump and his unwanted advances during a press conference at the Little America Hotel in Salt Lake City on Friday, Oct. 28, 2016. A former Miss Utah who has accused Donald Trump of kissing her without an invitation announced Friday that prominent women&apos;s rights attorney Gloria Allred will represent her if the Republican presidential candidate decides to sue her after the election. 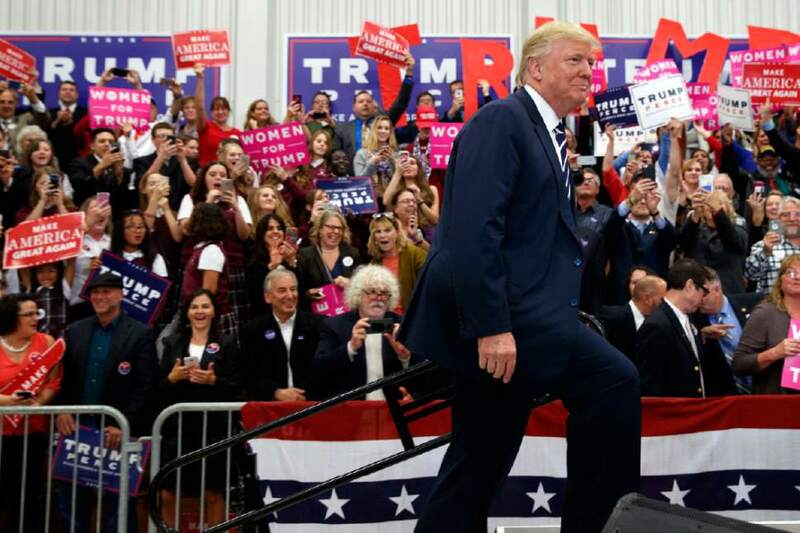 Trump has said he plans to do as much, alleging during the final presidential debate that recent claims from a dozen women have been "debunked" and suggesting they were invented by Hillary Clinton&apos;s campaign. 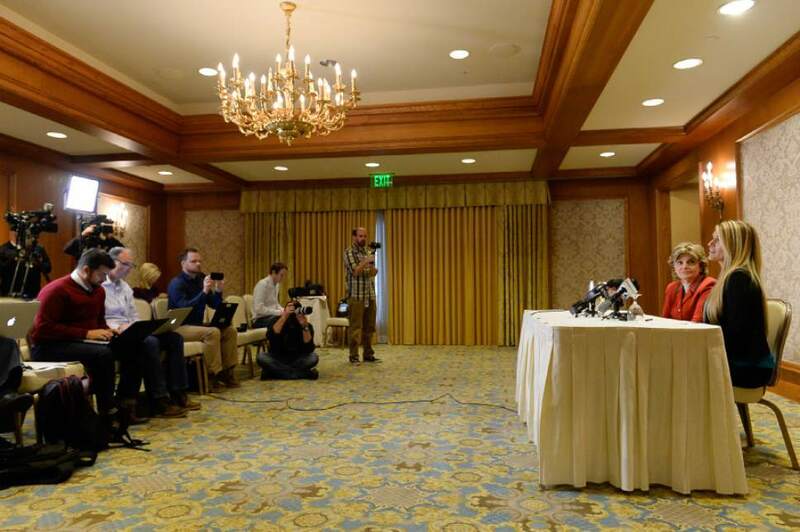 "I felt like Mr. Trump was trying to silence all of his accusers who had come forward, as well as others who may be thinking of coming forward," Taggart read from a prepared statement at a Salt Lake City hotel. "That&apos;s when I felt enough is enough, and I needed to stand up to Donald Trump. I feel that he is trying to bully and frighten us into silence." Trump&apos;s campaign did not respond to a request for comment Friday. Taggart has said she met Trump at the 1997 Miss USA pageant, where she has said Trump kissed her on the mouth. "I was so young and naive  I was 21, but I was 21 going on 16 at the time, mentally," Taggart said Friday. "Although it was awkward, I looked at my dad like &apos;What the heck was that?&apos; and he just kind of looked at me like, &apos;Brush it off.&apos; And so I just took it like ... maybe this is how East Coasters greet each other." Trump later invited her to meet with him in Manhattan, where he said he would introduce her to modeling agencies, she said. There, Taggart has said he again kissed her in an embrace that "felt like a little bit more to me," she told CNN&apos;s Erin Burnett earlier this month. She elaborated Friday: "It was definitely a different kiss. He looked at me different. The way he hugged me was different." His behavior made her wonder what Trump expected in return for his help, she said. She has previously said that Trump advised her to lie about her age. "What he did made me feel so uncomfortable that I ended up cutting my trip short, bought my own plane ticket, flew home and never spoke to him again," she said. After subsequent attempts to find work on the West Coast, Taggart said she became wary of men in the industry and returned to Utah. She said she posted about her encounter with Trump on Facebook earlier this year because she felt it was important for her friends to know about his character before they voted. When she was contacted by a reporter from The New York Times, she figured based on her experience that such stories would be commonplace, and she was surprised when she was quoted in The Times story. The resulting attention led her to feel "violated," she said. Reporters hounded her, and she was grateful when their calls stopped. But after the Washington Post released a 2005 "Access Hollywood" video in which Trump could be heard describing violent and unwanted sexual conduct with women, Taggart agreed to be interviewed on CNN and NBC. Reporters on Friday asked Taggart to explain a 1997 Deseret News story in which Taggart&apos;s father spoke positively about the amount of attention that she&apos;d received from Trump. Taggart said that at that point, having just deplaned after finishing in the top six at the pageant, she was "excited" by the attention shown to her by Trump and other modeling contacts, but that her father was the one who spoke at length about Trump. "I was most overwhelmed when Donald Trump came to me," she then told the paper. "He&apos;d talked with me throughout the week, saying he was very impressed with my look." Allred has held news conferences to introduce three other Trump accusers. Asked if Taggart might sue Trump, Allred said if Trump decides to file a lawsuit against anybody she represents, she will recommend to her clients that they file a cross-complaint of defamation. "The next move is his," she said. Allred said she&apos;s not sure what to expect  "I don&apos;t think Mr. Trump is even able to predict his own behavior very well," she said. Should Trump win the presidency, frequent depositions might prove a barrier to handling his responsibilities, she said. Taggart said that unlike Allred  an ardent Clinton supporter  she is Republican and is contemplating a vote for Provo-born independent Evan McMullin. "I just wish we had a better candidate to choose from," she said.